Friends, let me take a moment here to say a few words about the beloved brunch. It serves many purposes – many social, some psychological and occasionally medicinal. This is serious business: as we enter the ‘Christmas Do’ part of the year, it’s important to have a simple eggs based recipe that can help rouse you the next morning while you figure out just what exactly happened the night before. The only thing you need to know about this recipe is that it will lift you right out of purgatory (geddit) when you need it the most. Don’t be tempted to get fancy – this works because it’s so simple. Spicy, cheesy, tomatoey eggs. I don’t know why we didn’t think of this before! The ingredients listed below are ingredients you’ll probably have in your house already. My only advice would be to set these out on your kitchen counter before you leave for ease of access the next morning. There are a few moving parts in this recipe that you’ll want to be aware of: I’ve stated 1/2 tsp of chilli flakes for two people. It helps if you know your chilli flakes. We bought some supermarket guff a few months ago that we were throwing into dishes by the fistful just to get a little flavour. Conversely, just a shake of Bart’s chilli flakes blew our heads of (which is the way we like it). Know your limits and adjust accordingly. And then there’s the cheese. In Nigella’s original recipe, she suggests a very tame 2 tsp of parmesan cheese per person. First of all, I don’t think I’ve ever stopped at 2 tsp of any kind of cheese (I mean – really?). Secondly – I’m not ashamed to say that I adore a great handful of strong cheddar cheese on top of any tomatoey dish. Use as much as you feel you can justify. Grate responsibly. Plenty of rounds of your favourite toast. We currently can’t get enough of this olive bloomer. Heat the oil and fry the chilli flakes and garlic for about 2 minutes on a medium heat, until aromatic. Make sure you’re using a pan that can go under a grill (most pans these days are suitable for this). Add the can of chopped tomatoes and season well with salt and pepper. Put your grill on to ‘high’. Let the tomatoes simmer for about ten minutes. In quick succession, crack the eggs straight into the sauce, spacing them out as best you can. 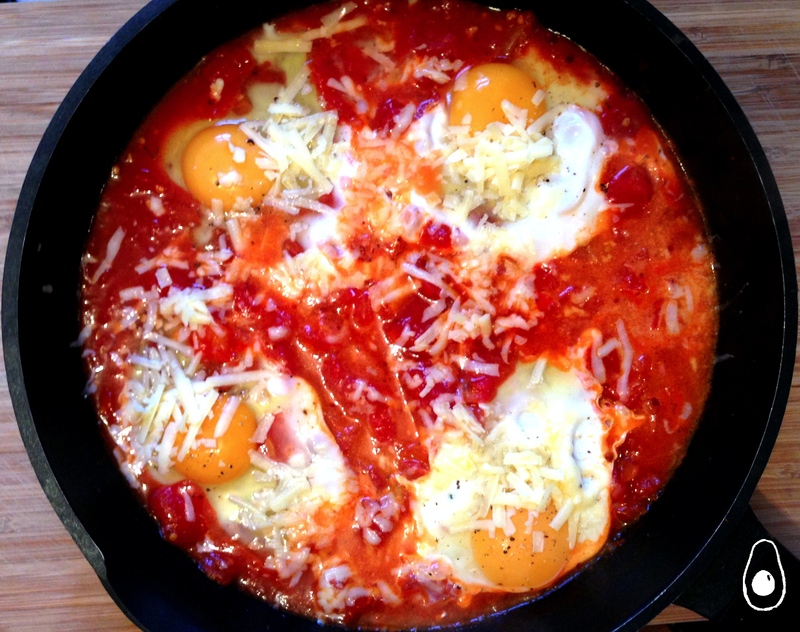 Sprinkle the grated cheese liberally on the eggs and on the tomato sauce. Make sure you leave part of the yolk exposed. Start toasting your bread. Put the pan straight under the hot grill and keep a very close eye on things. When the cheese starts bubbling, it’s done. Note that the eggs may look underdone (with that wobbly white consistency) but when you spoon them into the plate, they’ll still be cooking, especially as you pour molten tomato-cheese sauce on top. Don’t make the mistake we made and end up with chalky, over-done eggs. Serve with the toast (buttered), tea (strong) and a glass of orange juice (pulpy, for extra vitamins!). Belatedly sending this to Fiesta Friday! Oh I agree 2 tbsp are never enough cheese! I have to make these, eggs are so delicious!